We had a very pleasant ride on Sunday morning in Wings Mills despite the light rain that was supposed to fall in the afternoon, and the hot dogs and hospitality at the Lewis' post-ride spread were absolutely first rate! Many thanks to Ken, who is already thinking of a date for his ride next year. 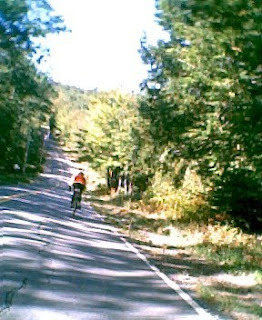 This Saturday our roads lead to Rome with its multiple hills - and an optional long loop around Great Pond. The weather looks like it will be clearing up for this weekend - hope to see you then! START: 9:00 AM, Rome Town Hall at the corner of Rt. 225 and Mercer Road, about 0.3 mi from the junction of Rt. 27 and Rt. 225. DISTANCES: 20 - 35 miles.